THE scourge of suicide is an increasing menace in our society and in order to raise funds for (PIPS), a leading suicide charity, a top level music festival has been organised and needs your support. The special Music Festival is set to run in Castlewellan to support PIPS with the first event taking place this Saturday 17 November, in the Kings Inn, Castlewellan. Themed on the huge wealth of local talent in the Castlewellan area, the Festival organisers are delighted to bring together in three concerts involving some of the best acts in Ireland. All these local singers, musicians and dancers have given their time and talent free of charge for this very worthy cause. 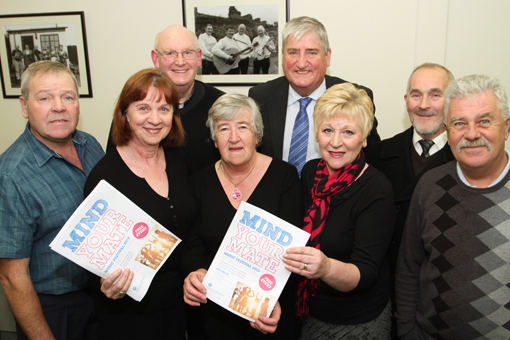 At the launch of the MInd Your Mate Music Festival in The Lodge in Castlewellan in aid of PIPS are from left, Jimmy Cowan, Newcastle Comhaltas Chairman, Mind Your Mate organiser Mona Owens, Fr Denis Kinley, Maureen Kelly, PIPS Newcastle organiser, Councillor Eamonn O’Neill, Doris McKenny, event organiser, the Rev Ken Nelson, and Brendan Scullion, Newcastle Comhaltas member. On Friday 17 November at 8pm in the Kings Inn. The Wildflowers who recently played on BBC Radio Ulster, comprising NualaMcEvoy; Triona; Ivor Greer; Gerry Flanagan; Ronnie Aulds and Michael Niblett; Brendan Murray, and the one and only Night People. The MC for the show is Paul McKenna of Downtown Radio. The second night of music is another you won’t want to miss. It is on the 24 November, again in the King’s Inn, Castlewellan. Thin Lizzie recorded a song sometime back called The Boys are Back in Town. Well that’s exactly what is going to happen. The ‘boys’ in this case refers to the reunion of ‘The Vibrolas’ from Annsborough featuring Jim Poland, Vincie Poland, Michael Niblett, Jimmy McCabe, Paddy Garland, Tony and Marie, Mona and country singer Carmel Poland. The festival organisers would like to see the local people of Annsborough and Castlewellan who have supported this band down through the years to come and join in the fun and support a worthy cause (while they relive the good ould times). Other acts appearing will be Kevin Murray, Seamus Garland, and Pat King. The Saturday 1 December gig will be the final night of the Festival in ‘The Lodge’, the Cultural Centre in Castlewellan. The Glee Singers from Newcastle will be performing hits from their top shows. There will be a barbershop quartet and the very talented Sean Donnelly will appear. Sean O’Neill and Niall McCrickard, all Ireland Bodhran Champions will also be on stage. Also appearing are players from Newcastle Comhaltas, The Phillips Sisters, The McCrickard Family, The Cowan Family, The Scullion Family, The Owens Family, and The McGrady Family. In addition the popular Community Choir from Castlewellan are tuning up for Christmas by performing at the festival. Annsborough Pipe Band will welcome everyone to the Lodge to make this an unforgettable night and local young people will put on a display of Irish Dancing. The inimitable Eamonn McMullan will be MC on the night. We would like everyone to support the three great nights of music and invite you to come along and leave a donation in the box at the door for PIPs. All through the years these entertainers have brought joy to people’s lives and they are now bringing it all back home and giving their time and talent free to help PIPS. Admission free! Donations to PIPS are very welcome! PIPs Programmes is a Not-for-Profit social enterprise which has developed a number of suicide prevention and awareness training programmes.